The New England Aquarium Marine Animal Rescue Team is featured in a fantastic article about sea turtle rescue appearing in May's Smithsonian Magazine. Readers follow one little Kemp's ridley turtle from the beach on Cape Cod through triage at the Mass. Audubon Sanctuary at Wellfleet Bay Audubon all the way to the Aquarium. Several Aquarium staffers are quoted as you get a unique perspective on the hard work that goes into rescuing cold-stunned sea turtles. Visit the Rescue Blog to get some of the rescuers' perspectives and some insider information about the turtles mentioned in the article! 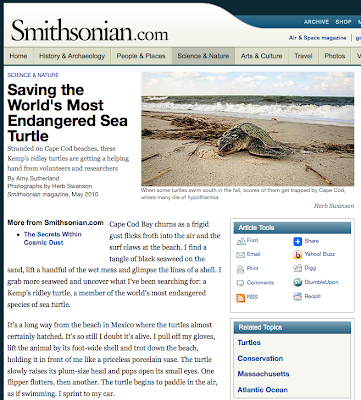 Here's a link to the article Saving the World's Most Endangered Sea Turtle.